Marjorie was always a quiet, gentle soul with a huge heart for other people and a very keen sense of humour. 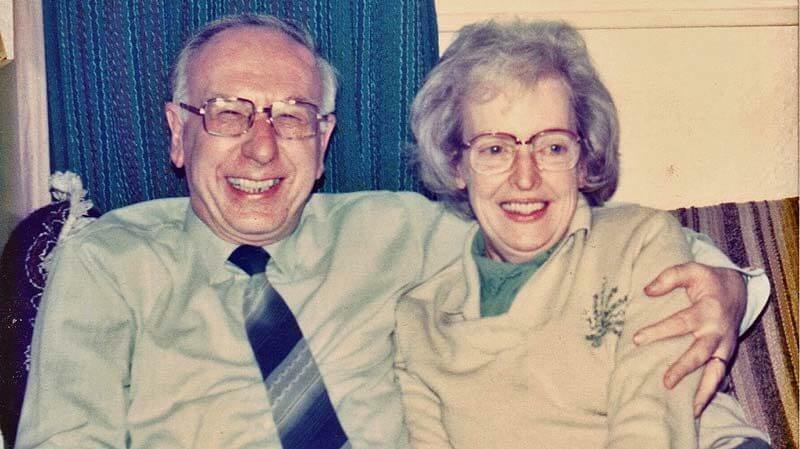 Marjorie and her husband Stan were stalwart members of St James & Emmanuel for many years. Latterly Stan became the more prominent of the two, and outlived Marjorie by 27 years. However for many years Marjorie was the ‘spiritual’ one of the family and was delighted when Stan began to follow suit. 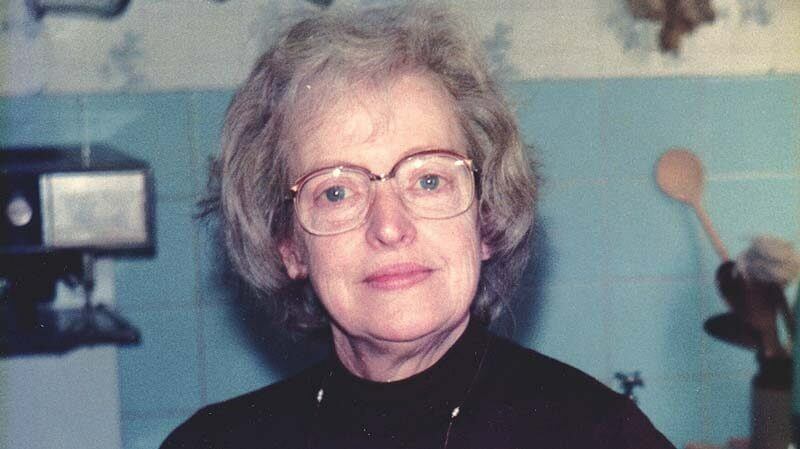 Marjorie Beardsell Crosland was born in Huddersfield in 1922 to a rather impoverished family. Beardsell was her mother’s maiden name. Her father was a lay reader in the Methodist church (he later became a stipendiary lay reader in the Church of England, apparently after his doctor had told him he needed a change!). He was a tinsmith by trade and went down to Cornwall to try and run his own business, leaving Marjorie and her mother to try and manage back in Huddersfield. His business was not a success, and Marjorie effectively ran the household on next to no money. Throughout her life she was both a superb cook and very adept at making money stretch as far as it possibly could. Marjorie first met Stan on her way to Greenhead School in Huddersfield; he used to her annoy her on the tram, pinching her hat as she went down the stairs and slotting her gabardine belt through the wooden slats in the back of her seat so that when she tried to get up to get off the tram she couldn’t! On 30 March 1937 a serendipitous set of circumstances led to them going to the cinema together; Stan didn’t have enough money to pay for them both so Marjorie had to pay for her own 9d ticket. Despite this inauspicious start Stan reckoned they ‘never looked back for the next 50 years after that!’ They soon became very close friends, mutually enjoying walking, particularly on the moors above Holmfirth and the countryside around Huddersfield’s Castle Hill. They were both members of the Youth Club at Newsome Church in Huddersfield and played tennis on the court at the vicarage. Marjorie took a job as a cost and wages clerk at a local mill, and indeed a lot of her working life was in that environment. She joined the WRAF in July 1942 and was posted to RAF Annan as a pay-clerk after training in Bridgnorth and Penarth. Stan and Marjorie were married at Newsome church on 25 March 1944 and they had their honeymoon near Dungeon Ghyll in the Lake District. However there was then a leave ban in preparation for D-Day so they did not meet again for six months. Marjorie was demobbed in October 1945, though it would be many months before Stan was also demobilised. While he was sent on further postings in Shropshire and the far north of Scotland, Marjorie got a job at David Brown Tractors in Meltham near Huddersfield and found a house in Newsome where she and Stan were able to set up their first home. Their first son, Peter, was born in 1947 and in 1950 the family moved to Chester before settling in Didsbury in 1958. Like most women of her generation Marjorie was a ‘stay-at-home Mum’ to her two boys. Her cooking was legendary. Marjorie was always active in the church; she was involved in Cornerstones, a group for older people in the church, and was a stalwart of the Mothers’ Union for many years. She also helped to produce the church magazine and was church treasurer. She was always a quiet, gentle soul with a huge heart for other people. She also had a very keen sense of humour and if something ‘tickled’ her (to use her own phrase) she would go off into peals of infectious giggles. In the early days at St James the then Rector, Ronald Cherry Weaver, would very often visit in the evenings and would always hope that Marjorie would produce some of her legendary scones and Devil’s Food Cake. These were often forthcoming, and in fact she would never sit still for long: she always had to be up and doing something. She was also a great knitter, with her own distinctive technique; she would always tuck the needles under her arms when she knitted and you could always tell which were her needles from the resulting bend they always took on. After her younger son Stephen started secondary school in central Manchester, she returned to work as a part-time accounts clerk at Guardian Royal Exchange Insurance in John Dalton Street in Manchester. As the church entered its phase of renewal both Marjorie & Stan were keen to be in the forefront of new developments and were tremendously supportive to the Rector, David Hallett. They ran a Home Group from 1977, in which they managed to blend people with learning difficulties and mental health issues with people with PhDs. Tragically in November 1984 Marjorie was diagnosed with lung cancer. After an operation she had chemotherapy in 1985 which helped and she and Stan managed to get a holiday in Guernsey. However worse was to come, in January 1986 she developed a brain tumour which gradually produced paralysis and she eventually became bed-ridden. A nursing team of church members was formed which visited her and Stan each evening, enabling her to remain at their home in Gaddum Road. She lapsed into comas at times through Christmas 1986 and eventually died on 26 February 1987. She and Stan had enjoyed 43 years of marriage. There was a full church for her funeral and, after cremation, her ashes were amongst the first to be scattered in the Garden of Remembrance in St James Churchyard.